Magic Mix Body Wax gives painted and polished surfaces a protective coating (without buffing) that lasts for several months. To protect brand new chrome wheels or highly polished aluminum use Magic Mix Body Wax. Its high carnauba content and specialized polish leaves behind an incredible shine. Magic Mix Body Wax is also a delight to use on paints. It protects and keeps things in a great looking condition. Detailing shortcut! 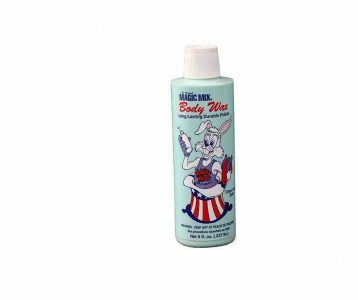 Mix two parts Magic Mix Speed Wax and one part Magic Mix Body Wax in a spray bottle for a simple way to get a quick, long-lasting shine. This combination makes it easier to remove the wax without much rubbing. You can also use Speed Wax to aid in removing Body Wax after it hazes. Do you have black streaks on your semi-trailer, motorhome, etc.? This phenomenon is from the aluminum rivets and rain gutters oxidizing. Polluted rain facilitates the process. Use Magic Mix Polish and Magic Mix Body Wax to clean. Mix the two products together to make 16 ozs. Clean vehicle as if waxing. You'll be amazed by the results. Do you have a vehicle, boat, or hot tub with oxidized (chalking) paint or fiberglass? Use Magic Mix Metal Polish and a soft cloth. With light to moderate pressure give these surfaces a finish that looks like new. Always reseal the surface with Magic Mix Body Wax to keep it looking nice. Magic Mix Body Wax will be added to Cart!